Cebu Pacific is planning to launch several new long-haul destinations, up to five in the Middle East and one in Australia, in 2014 as it expands its A330-300 fleet. The carrier currently operates two A330-300s and is taking three additional A330s in 2014, with deliveries in Feb-2014, early 2Q2014 and late 3Q2014, according to CAPA's Fleet Database. The carrier’s new long-haul low-cost operation, which now consists of just one route with Manila-Dubai, has experienced a challenging start. There are plenty of options to expand the long-haul network but each potential destination has its own challenges. There will be stiff competition to overcome in Cebu Pacific’s next two long-haul markets – Australia and Saudi Arabia – as well as in most of its other planned new markets in the Middle East – Kuwait, Oman and Qatar. All are expected to be launched by the end of 2014, starting with two cities in Saudi Arabia and one in Australia. This is the second of a two-part series of analysis reports on Cebu Pacific’s new-long-haul operation. The first part analysed the Manila-Dubai route and the challenges confronting the carrier in Philippines-UAE market, which has seen a flood of new capacity as Cebu Pacific, Philippine Airlines and PAL Express all launched services to the UAE in the first half of 4Q2013. Cebu Pacific launched daily service between Manila and Dubai on 7-Oct-2013. The carrier took delivery of its first A330-300, which is in single-class 436-seat configuration, in Jun-2013 with the second aircraft arriving in Sep-2013. Cebu Pacific first announced plans to expand into the emerging long-haul low-cost sector and committed to leasing A330-300s in early 2012. With the launch of Dubai, Cebu Pacific became the fourth carrier with long-haul LCC operations in Asia-Pacific, joining Malaysia-based AirAsia X, Australia-based Jetstar Airways and Singapore’s Scoot. AirAsia X multi-hub strategy to shake up Thailand market from early 2014. Is Indonesia next? Cebu Pacific initially got its feet wet with widebody operations by using its first A330 from early Jul-2013 on two regional international routes, Manila-Seoul and Manila-Singapore. Some flights on the Manila to Hong Kong route were also up-gauged to the A330 from mid-September to early October, using the second aircraft before Dubai was launched. The type was also briefly used at the same time to operate domestic services between Manila and Cebu. Schedules from OAG for the current week show that Cebu Pacific is now deploying its two A330s on daily services to Dubai as well as one of its daily flights between Manila and Singapore and its only current daily flight between Manila and Seoul Incheon. As CAPA reported in the first instalment of this series, Cebu Pacific’s online booking engine shows the carrier temporarily has cut back its Dubai service to five weekly frequencies through end of Feb-2014. It is now selling six weekly flights for most of Mar-2014 before resuming daily services from late Mar-2014. Using the A330 on the carrier’s densest – shorter haul – regional international routes is logical as it helps maximise the utilisation of slots (although in some cases there are bilateral limitations which prevent Cebu Pacific from up-gauging unless it reduces frequencies as it already is fully utilising its capacity entitlements). The shorter routes also enable the carrier to improve average utilisation rates and seat economics. Cebu Pacific currently operates 28 weekly frequencies from Manila to Hong Kong, 25 from Manila to Singapore and seven to Seoul. Some of Cebu Pacific’s full-service competitors operate widebody aircraft head-to-head on these routes. Cebu Pacific currently utilises its A330 fleet an average of 16 hours per day (based on Dubai being operated daily). Forward schedules show the carrier plans to continue operating its initial two A330s on the same three routes in rotation. Cebu Pacific has not yet announced or set a launch date for any additional long-haul routes, although the carrier plans to take its third A330 in Feb-2014. The third aircraft is intended for long-haul expansion but Cebu Pacific will almost certainly end up initially using the aircraft on short-haul routes. Australia and Saudi Arabia are Cebu Pacific’s most likely next two long-haul destinations. Cebu Pacific plans to launch two destinations in Saudi Arabia – Dammam and Riyadh – and one destination in Australia – Melbourne or Sydney. But it has not yet decided which market will be added first. Australia will initially be served with five weekly flights although Cebu Pacific hopes to move relatively quickly to a daily service to its first Australian destination, then later on look at also serving the second destination. Owing to an on-going bilateral stand-off (Australia wants new Philippine beyond rights for Jetstar in return for added capacity for Philippine carriers), Cebu Pacific currently only has sufficient capacity entitlements to operate five weekly flights to Australia. But it is confident that Australia and the Philippines will agree to an extended air services agreement in 2014 which will give it the ability to expand in the market. Cebu Pacific had previously said it would not launch Australia until it was assured it had the flexibility to serve the market daily. Such statements, while certainly well founded commercially, could have been an attempt to persuade Australia back to the negotiating table. Australian airports and tourism authorities are eager to attract Cebu Pacific, having seen the impact of the entrance of Asia’s other three existing long-haul LCCs (AirAsia X, Jetstar and Scoot) in significantly growing the Australia-Malaysia, Australia-Thailand and Australia-Singapore markets. Compared to other major Southeast Asian markets, the Philippines is now relatively under-served from Australia. Currently there are only about 4,600 weekly one-way seats between the two countries. Philippine Airlines (PAL) currently accounts for about 69% of this capacity with its four weekly 777-300ER flights to Sydney, three A340-300 flights to Melbourne and three weekly A320 flights to Darwin with continuing service to Brisbane. 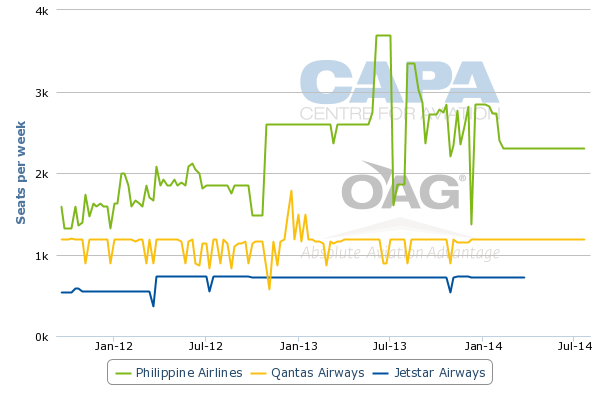 Qantas, which operates four weekly A330-300 flights from Sydney to Manila, accounts for 26% of total seat capacity between Australia and the Philippines while Jetstar accounts for the remaining 15%. But Jetstar is dropping Manila at the end of Mar-2014, which will reduce total one-way seat capacity between Australia and the Philippines to only about 3,500 weekly seats. 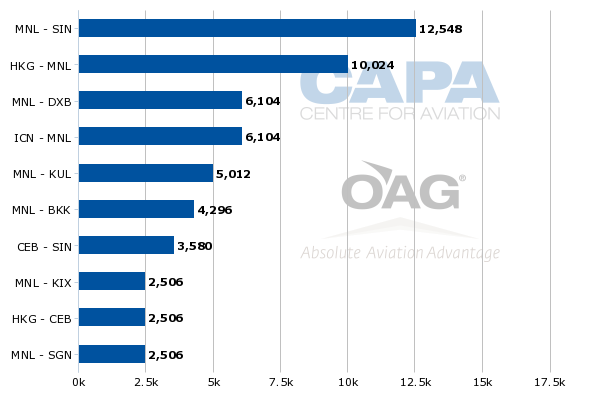 In comparison there are currently about 72,000 weekly one-way seats in the Australia-Singapore market and about 43,000 seats in the Australia-Malaysia market, according to CAPA and OAG data. Indonesia and Thailand are also much bigger markets than the Philippines for Australia with about 36,000 and 22,000 weekly one-way seats respectively. The Philippines will always be a smaller market for Australia but there is huge potential for both inbound and outbound traffic growth. The Philippines is just starting to consolidate a position as a major tourist destination. More capacity and lower fares will help drive Philippine tourist authority efforts to attract more Australians and put the Philippines firmly on the radar screen of holidaying Australians alongside Indonesia, Malaysia and Thailand. There is also potential growth in the visiting friend and relatives sector as Australia has a sizeable Filipino expatriate population estimated to be over 300,000. Australian tourism authorities also see potential in Philippines as a larger inbound source market. As is the case in the other Southeast Asian markets, Australia is hoping to cash in on a growing middle class and raising discretionary incomes. LCC services open up this market as fares are lowered to more affordable levels. Cebu Pacific’s strength is in outbound Philippines and expatriate Filipino sectors as its brand is not well known in foreign markets such as Australia. The carrier’s decision to expand into the long-haul low-cost sector was mainly driven by demand from Filipino expatriates working in markets beyond narrowbody range of Manila, particularly the Middle East. But for Australia the market dynamics are different and Cebu Pacific will need to rely more heavily on carrying Australians. The expatriate Filipino market is very seasonal, with most Filipinos seeking to go home during holiday periods, and Australia visa restrictions will likely limit significant growth in the outbound Philippines to Australia market. Cebu Pacific has been looking at potentially launching Australia services in the near-term using its third A330. But given its lack of brand recognition the carrier will surely proceed cautiously and not launch the first Australia route with a short lead time. Australians will be attracted to low advance purchase fares as they make their holiday decisions. Cebu Pacific’s leading domestic network will also be appealing, as accessing the most popular tourist spots require domestic flights. As Cebu Pacific could mange to enter the Saudi Arabia market with shorter lead times, the planned Manila-Dammam and Manila-Riyadh routes are more likely options for the third aircraft. While it is possible for the carrier to launch services to Saudi Arabia as early as Mar-2014 as it already has the traffic rights, a 2Q2014 launch seems more likely at this point. 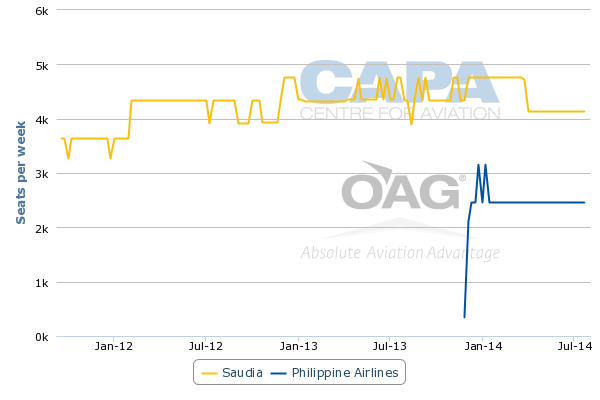 With Cebu Pacific expecting to receive its fourth A330 in the first half of 2Q2014 (April or early May), the carrier could wait to launch Saudi Arabia until it has four aircraft in its fleet. This would give Cebu Pacific the flexibility to continue using the third aircraft for short-haul flights until Australia is also launched, potentially in 3Q2014. Cebu Pacific says it plans to serve Dammam and Riyadh with separate non-stop flights, with one route operating three times per week and one four times per week. The carrier also considered Jeddah but has decided against launching Jeddah, which is seen more as a Haj rather than migrant worker market. Cebu Pacific has sufficient traffic rights to also serve Jeddah as Dammam is designated as an open skies airport under the Philippines-Saudi Arabia bilateral and therefore does not count towards its entitlement. Cebu Pacific will compete in the Philippines-Saudi Arabia market against Saudia and PAL as well as one-stop carriers, primarily Cathay Pacific, Emirates, Etihad, Qatar Airways and – and to a lesser extent – Gulf Air and Kuwait Airways. All these carriers can be low fare competitors and are accustomed to working with the labour contractors which control almost all the traffic between Saudi Arabia and the Philippines. PAL resumed services to Saudi Arabia in Dec-2013 and currently operates three weekly A330-300 flights to Dammam and four weekly A330-300 flights to Riyadh, according to schedule data from OAG. Saudia operates six weekly flights 747-400 flights in the Manila-Riyadh market and four weekly 747-400 flights in the Manila-Dammam market. Saudia also currently operates two weekly 747-400 flights between Manila and Jeddah. Saudia is a tough competitor in this market and its ties to the Saudi Arabian government can give it a competitive advantage. Philippines-Saudi Arabia is a large market consisting almost entirely of migrant worker traffic as Saudi Arabia has about 1.5 million Filipino expatriates, making it the second largest overseas Filipino population after the US. But as in the case with the Philippines-UAE market, the launch of flights from both Cebu Pacific and PAL could quickly turn a market that had been underserved into an overcapacity situation. As Cebu Pacific and PAL will have to rely entirely on the local Philippines-Saudi Arabia market to fill their A330s, it could be difficult to secure sufficient load factors on a year-round bi-directional basis. PAL has already adjusted capacity plans for Saudi Arabia. When it first loaded Saudi Arabia schedules in Jun-2013, or about six months prior to launch, PAL planned six weekly flights to Riyadh instead of four and four weekly flights to Jeddah, which it did not end up launching at all. Only Dammam was launched at the originally planned capacity level. As CAPA reported in the first instalment in this series, the resumption of services by the PAL Group to Middle East – including the UAE, Saudi Arabia and Qatar – is part of an ambitious expansion plan by new PAL owner San Miguel. PAL had little choice but to go ahead with several new Middle East routes given its commitment to rapidly increase the size of its A330 fleet. Unfortunately for Cebu Pacific, the expansion at PAL coincided with the LCC expanding into the long-haul sector with the Middle East its main target. Cebu Pacific’s planned seven weekly flights to Saudi Arabia will add another 3,000 one-way seats to a market which has already expanded by over 50% as a result of PAL’s entrance. With Cebu Pacific entering total non-stop capacity will more than double from about 4,500 weekly seats to roughly 10,000. While Saudi Arabia-Philippines is a big market, it is seasonal and during certain times of the year is very unbalanced with almost all passengers going in one direction. Cebu Pacific has gone through a steep learning curve as it faced some of the same challenges in the Philippines-UAE market. With Saudi Arabia the challenges may not be quite as stiff, as Cebu Pacific now has some knowledge of the Middle East. But the carrier will need to be aggressive in pricing and overcome low load factors on certain sectors during slower times of the year. Cebu Pacific plans to allocate the equivalent of one aircraft to the Saudi Arabian market. Australia will be allocated slightly less than one aircraft as it initially will be served with five rather than seven weekly flights. With the spare capacity left from the aircraft used for Australia and Cebu Pacific’s fifth A330, which is slated to be delivered in late 3Q2014, the carrier is looking to operate three low frequency routes to the Middle East – Manila to Oman, Kuwait and Doha. Cebu Pacific says it recently secured approval for Oman, is in the final stages of securing approvals for Kuwait and has an application pending for Qatar. Over a year ago, Cebu Pacific was initially allocated two frequencies for the Manila-Doha route but has been seeking additional frequencies. 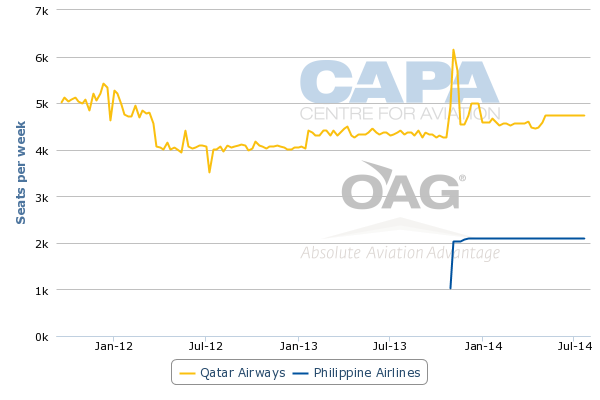 At the time PAL held the other six frequencies available to Filipino carriers in the Philippines-Qatar bilateral but was allowing Qatar Airways to use them on its behalf as part of a codeshare arrangement between the two carriers. Cebu Pacific was seeking an interpretation from Philippine authorities that prohibited the continued use of Philippine carrier traffic rights by foreign carriers. PAL subsequently decided to launch services to Doha, taking back the six traffic rights that Qatar had been using. PAL began serving Doha with six weekly flights on 1-Nov-2013. At the same time Qatar Airways had to reduce its Manila service from 14 to 8 weekly flights. But the carrier was able to maintain total capacity in the Manila market by launching daily services to Manila alternative airport Clark at the end of Oct-2013. Cebu Pacific has been seeking at least one additional frequency, reportedly filing a request in mid-2013 to initially serve the Manila-Doha route in early 2014 with three weekly flights. Three or more weekly frequencies would require an extension of the air services agreement and give Qatar Airways the opportunity to add back at least one frequency to Manila. As is the case with the UAE and Saudi Arabia markets, there is a risk of over-capacity if Cebu Pacific joins PAL in competing with Qatar Airways in the Philippines-Qatar market. Qatar only has about 300,000 expatriate Filipinos, a sizeable community but much smaller than UAE or Saudi Arabia. Total capacity in the Philippines-Qatar market has already gone up by over 50% as a result of the launch of services by PAL. Three weekly flights from Cebu Pacific would result in a further 20% increase. Cebu Pacific may also potentially operate three or four frequencies to Kuwait and two frequencies to Oman, which would provide a total of 22 or 23 weekly flights to the Middle East along with five weekly frequencies to Australia. This would result in full allocation of four aircraft. The fifth aircraft would essentially be used to continue operating the two existing A330 regional international routes (Singapore and Seoul). The Kuwait and Oman markets are even smaller Filipino expatriate markets than Kuwait but provide significantly less competition. There are currently less than 200,000 Filipino expatriates in each country. Kuwait Airways currently serves Manila six times per week but only via Bangkok. Cebu Pacific would be the first carrier offering a non-stop product, giving it a competitive and cost advantage. Cebu Pacific was reportedly awarded about one year ago traffic rights for up to four weekly services to Kuwait. The carrier has held recent meetings with Kuwaiti authorities and is close to securing final approvals for its proposed Manila-Kuwait service. The Philippines-Oman market is now only served on a one-stop basis by other Middle Eastern carriers. Cebu Pacific says it secured approvals for Oman in early Jan-2014 and is looking at initially serving the market with two weekly flights. Cebu Pacific’s long-haul unit previously said it was also looking at Abu Dhabi and Bahrain. But the carrier has likely put any consideration of Abu Dhabi on the backburner until it improves its performance on the Dubai route. With PAL launching Abu Dhabi and PAL Express joining Cebu Pacific in the Dubai market, Cebu Pacific also adding Abu Dhabi would be overkill. Bahrain is an open skies market but is very small, with less than 100,000 Filipino expatriates. Gulf Air already serves the Manila-Bahrain route with daily A330 flights. Competing with Gulf Air would be challenging given the small size of the local market and Gulf Air’s ability to offer its Manila passengers connections to other larger Middle Eastern markets. Cebu Pacific also is interested in potentially using its A330 fleet to serve Hawaii. But Honolulu and plans for A320 service to Guam are contingent on the Philippines being upgraded by the US FAA to a Category 1 safety rating. Philippine authorities are confident the upgrade will occur in 2014, which will also enable PAL to pursue expansion in the US market. But an upgrade is far from certain. If a Category 1 rating were to be secured within the next few months, Cebu Pacific could adjust its Middle East plans to free up capacity for Honolulu. But the more likely scenario is to launch Honolulu in 2015, assuming a Category 1 rating is secured by then. According to Cebu Pacific's fleet plan, the carrier is slated to take a sixth A330s in 2015, which would give it the capacity to launch Honolulu as well as potentially add a second Australian destination. Cebu Pacific also is also seeking to be removed from the EU blacklist, which currently prevents it from serving Europe. But the carrier is unlikely to launch services to the EU for at least the short to medium term. Cebu Pacific prefers to stick with widebody routes of less than 10 hours as the economics of longer routes are not attractive. Russia could potentially be in its preferred range and has reportedly been considered. But Russia is not currently in the plans for 2014. Cebu Pacific also recently applied for rights to serve Israel. But Tel Aviv service is also not in its current plans for 2014. Moscow and Tel Aviv would be different type of routes as they would rely predominantly on inbound tourist traffic rather than Filipino expatriates, which has been Cebu Pacific’s primary focus in expanding into the long-haul sector. Neither Moscow nor Tel Aviv is currently served from Manila. With the right support from the Philippine tourism sector they could potentially be viable low frequency routes. They may provide Cebu Pacific intriguing alternatives, particularly if the Middle East operation is unprofitable, but are unlikely to be pursued in the short term. Cebu Pacific needs to be open minded as it looks to find suitable markets for its new and rapidly expanding widebody fleet. In initially committing to six A330s the carrier likely did not factor in the ambitious long-haul expansion from PAL that has since occurred. The expansion at PAL has particularly made the Philippines-Middle East market more competitive. Cebu Pacific, despite the relatively tough market conditions, is still moving forward in 2014 with rapid expansion of its Middle East network and its longstanding desire to serve Australia. It has little choice as it has already committed to leasing three additional A330s while the US and EU markets remain closed. There are still ample opportunities for Cebu Pacific in the Philippine long-haul market and the carrier is likely at some point to acquire additional widebody aircraft beyond the initial six A330s. Over the long term the prospects for the long-haul LCC market throughout Asia, including in the Philippines, are bright. But there will almost certainly be losses in the short-term for the Cebu Pacific long-haul unit, even potentially hefty losses. The reality is the Philippine long-haul market is not nearly as under-served as it was two years ago when Cebu Pacific decided to engage in the long-haul LCC sector.